2008-12-19 Assigned to ACUSHNET COMPANY reassignment ACUSHNET COMPANY ASSIGNMENT OF ASSIGNORS INTEREST (SEE DOCUMENT FOR DETAILS). Assignors: COMEAU, BRIAN, LACY, WILLIAM B., SULLIVAN, MICHAEL J. A golf ball comprising a thermoplastic inner core layer that has a geometric center hardness greater than its surface hardness to define a “negative” hardness gradient. An outer core layer is disposed about the inner core and is formed from a substantially homogenous thermoset composition, typically rubber, and has an inner surface hardness substantially less than its outer surface hardness to define a “positive” hardness gradient. An inner cover layer is disposed about the outer core layer and an outer cover layer is disposed about the inner cover layer. The “negative” hardness gradient of the inner core is typically −1 to −5 Shore C and the “positive” hardness gradient of the core layer is typically at least 25 Shore C. The difference between the inner core surface hardness and the outer core inner surface hardness, Δh, should be at least 25 Shore C.
This application is a continuation-in-part of U.S. patent application Ser. No. 12/196,522, filed Aug. 22, 2008 now U.S. Pat. No. 7,582,025, which is a continuation-in-part of Ser. No. 11/939,635 U.S. Pat. No. 7,427,242, filed Nov. 14, 2007. FIG. 1 is a graph showing preferred hardness values and relationships between the “negative” hardness gradient thermoplastic inner core layer and the steep “positive” hardness gradient thermoset outer core layer of the present invention. The golf balls of the present invention may include a single-layer (one-piece) golf ball, and multi-layer golf balls, such as one having a core and a cover surrounding the core, but are preferably formed from a core comprised of a solid center (otherwise known as an inner core layer) and an outer core layer, and a cover layer. Of course, any of the core and/or the cover layers may include more than one layer. In a preferred embodiment, the core is formed of a thermoplastic inner core layer and a rubber-based outer core layer where the inner core has a “soft-to-hard” hardness gradient (a “negative” hardness gradient) as measured radially inward from the outer surface and the outer core layer has a “hard-to-soft” hardness gradient (a “positive” hardness gradient) as measured radially inward from the outer core outer surface. In a preferred embodiment, the golf balls of the present invention include an inner core layer formed from a thermoplastic (TP) material to define a “negative” hardness gradient and an outer core layer formed from a thermoset (TS) material to define a steep “positive” hardness gradient. The TP hardness gradient may be created by exposing the cores to a high-energy radiation treatment, such as electron beam or gamma radiation, such as disclosed in U.S. Pat. No. 5,891,973, which is incorporated by reference thereto, or lower energy radiation, such as UV or IR radiation; a solution treatment, such as in a isocyanate, silane, plasticizer, or amine solution, such as suitable amines disclosed in U.S. Pat. No. 4,732,944, which is incorporated by reference thereto; incorporation of additional free radical initiator groups in the TP prior to molding; chemical degradation; and/or chemical modification, to name a few. The magnitude of the “negative” hardness gradient is preferably greater than (more negative) −1 Shore C, more preferably greater than −3 Shore C, and most preferably greater than −5 Shore C. In one specific embodiment, the magnitude of the “negative” hardness gradient is −1 to −5. The organic acids of the present invention are aliphatic, mono- or multi-functional (saturated, unsaturated, or multi-unsaturated) organic acids. Salts of these organic acids may also be employed. The salts of organic acids of the present invention include the salts of barium, lithium, sodium, zinc, bismuth, chromium, cobalt, copper, potassium, strontium, titanium, tungsten, magnesium, cesium, iron, nickel, silver, aluminum, tin, or calcium, salts of fatty acids, particularly stearic, behenic, erucic, oleic, linoleic or dimerized derivatives thereof. It is preferred that the organic acids and salts of the present invention be relatively non-migratory (they do not bloom to the surface of the polymer under ambient temperatures) and non-volatile (they do not volatilize at temperatures required for melt-blending). Other layers of a dual core, preferably the outer core layer, may be formed from a rubber-based composition treated to define a steep “positive” hardness gradient, and preferably the inner core layer is formed from the thermoplastic material of the invention and has a “positive” or preferably “negative” hardness gradient. For example, the inner core may be formed from the ‘hardness gradient’ thermoplastic material of the invention and the outer core layer may include the rubber composition (or vice versa). A base thermoset rubber, which can be blended with other rubbers and polymers, typically includes a natural or synthetic rubber. A preferred base rubber is 1,4-polybutadiene having a cis structure of at least 40%, preferably greater than 80%, and more preferably greater than 90%. Other suitable thermoset rubbers and preferred properties, such as Mooney viscosity, are disclosed in U.S. Pat. No. 7,351,165, filed Mar. 13, 2007, and U.S. Pat. No. 7,458,905, filed Mar. 23, 2007, both of which are incorporated herein by reference. The steep “negative” or, preferably, “positive” hardness gradient outer core layer(s) are formed from a composition including at least one thermoset base rubber, such as a polybutadiene rubber, cured with at least one peroxide and at least one reactive co-agent, which can be a metal salt of an unsaturated carboxylic acid, such as acrylic acid or methacrylic acid, a non-metallic coagent, or mixtures thereof. Preferably, for the “negative” hardness gradient core embodiment, a suitable antioxidant is included in the composition. An optional soft and fast agent (and sometimes a cis-to-trans catalyst), such as an organosulfur or metal-containing organosulfur compound, can also be included in the core formulation. To form the steep “positive” hardness gradient across the outer core layer, a gradient-promoting additive (GPA). Suitable GPA's are discussed below. 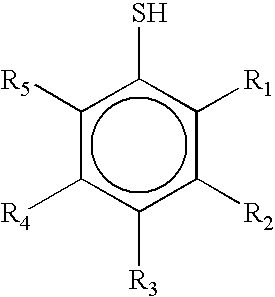 Suitable peroxide initiating agents include dicumyl peroxide; 2,5-dimethyl-2,5-di(t-butylperoxy)hexane; 2,5-dimethyl-2,5-di(t-butylperoxy)hexyne; 2,5-dimethyl-2,5-di(benzoylperoxy)hexane; 2,2′-bis(t-butylperoxy)-di-iso-propylbenzene; 1,1-bis(t-butylperoxy)-3,3,5-trimethyl cyclohexane; n-butyl 4,4-bis(t-butyl-peroxy)valerate; t-butyl perbenzoate; benzoyl peroxide; n-butyl 4,4′-bis(butylperoxy)valerate; di-t-butyl peroxide; or 2,5-di-(t-butylperoxy)-2,5-dimethyl hexane, lauryl peroxide, t-butyl hydroperoxide, α-αbis(t-butylperoxy)diisopropylbenzene, di(2-t-butyl-peroxyisopropyl)benzene, di-t-amyl peroxide, di-t-butyl peroxide. Preferably, the rubber composition includes from about 0.25 to about 5.0 parts by weight peroxide per 100 parts by weight rubber (phr), more preferably 0.5 phr to 3 phr, most preferably 0.5 phr to 1.5 phr. In a most preferred embodiment, the peroxide is present in an amount of about 0.8 phr. These ranges of peroxide are given assuming the peroxide is 100% active, without accounting for any carrier that might be present. Because many commercially available peroxides are sold along with a carrier compound, the actual amount of active peroxide present must be calculated. Commercially-available peroxide initiating agents include DICUP™ family of dicumyl peroxides (including DICUP™ R, DICUP™ 40C and DICUP™ 40KE) available from Crompton (Geo Specialty Chemicals). Similar initiating agents are available from AkroChem, Lanxess, Flexsys/Harwick and R. T. Vanderbilt. Another commercially-available and preferred initiating agent is TRIGONOX™ 265-50B from Akzo Nobel, which is a mixture of 1,1-di(t-butylperoxy)-3,3,5-trimethylcyclohexane and di(2-t-butylperoxyisopropyl)benzene. 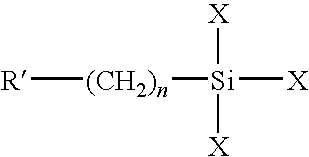 TRIGONOX™ peroxides are generally sold on a carrier compound. To form the steep “positive” hardness gradient across the outer core layer of the present invention, it is preferred that a gradient-promoting additive (GPA) is used are present. Suitable GPA's include, but are not limited to benzoquinones, resorcinols, catechols, quinhydrones, and hydroquinones. Those, and other methods and material for creating a steep “positive” hardness gradient are disclosed in U.S. patent application Ser. Nos. 12/168,979; 12/168,987; 12/168,995; and 12/169,002, which are incorporated herein by reference thereto. Additional suitable examples of soft and fast agents (that are also believed to be cis-to-trans catalysts) include, but are not limited to, 4,4′-diphenyl disulfide; 4,4′-ditolyl disulfide; 2,2′-benzamido diphenyl disulfide; bis(2-aminophenyl)disulfide; bis(4-aminophenyl)disulfide; bis(3-aminophenyl)disulfide; 2,2′-bis(4-aminonaphthyl)disulfide; 2,2′-bis(3-aminonaphthyl)disulfide; 2,2′-bis(4-aminonaphthyl)disulfide; 2,2′-bis(5-aminonaphthyl)disulfide; 2,2′-bis(6-aminonaphthyl)disulfide; 2,2′-bis(7-aminonaphthyl)disulfide; 2,2′-bis(8-aminonaphthyl)disulfide; 1,1′-bis(2-aminonaphthyl)disulfide; 1,1′-bis(3-aminonaphthyl)disulfide; 1,1′-bis(3-aminonaphthyl)disulfide; 1,1′-bis(4-aminonaphthyl)disulfide; 1,1′-bis(5-aminonaphthyl)disulfide; 1,1′-bis(6-aminonaphthyl)disulfide; 1,1′-bis(7-aminonaphthyl)disulfide; 1,1′-bis(8-aminonaphthyl)disulfide; 1,2′-diamino-1,2′-dithiodinaphthalene; 2,3′-diamino-1,2′-dithiodinaphthalene; bis(4-chlorophenyl)disulfide; bis(2-chlorophenyl)disulfide; bis(3-chlorophenyl)disulfide; bis(4-bromophenyl)disulfide; bis(2-bromophenyl)disulfide; bis(3-bromophenyl)disulfide; bis(4-fluorophenyl)disulfide; bis(4-iodophenyl)disulfide; bis(2,5-dichlorophenyl)disulfide; bis(3,5-dichlorophenyl)disulfide; bis (2,4-dichlorophenyl)disulfide; bis(2,6-dichlorophenyl)disulfide; bis(2,5-dibromophenyl)disulfide; bis(3,5-dibromophenyl)disulfide; bis(2-chloro-5-bromophenyl)disulfide; bis(2,4,6-trichlorophenyl)disulfide; bis(2,3,4,5,6-pentachlorophenyl)disulfide; bis(4-cyanophenyl)disulfide; bis(2-cyanophenyl)disulfide; bis(4-nitrophenyl)disulfide; bis(2-nitrophenyl)disulfide; 2,2′-dithiobenzoic acid ethylester; 2,2′-dithiobenzoic acid methylester; 2,2′-dithiobenzoic acid; 4,4′-dithiobenzoic acid ethylester; bis(4-acetylphenyl)disulfide; bis(2-acetylphenyl)disulfide; bis(4-formylphenyl)disulfide; bis(4-carbamoylphenyl)disulfide; 1,1′-dinaphthyl disulfide; 2,2′-dinaphthyl disulfide; 1,2′-dinaphthyl disulfide; 2,2′-bis(1-chlorodinaphthyl)disulfide; 2,2′-bis(1-bromonaphthyl)disulfide; 1,1′-bis(2-chloronaphthyl)disulfide; 2,2′-bis(1-cyanonaphthyl)disulfide; 2,2′-bis(1-acetylnaphthyl)disulfide; and the like; or a mixture thereof. Preferred organosulfur components include 4,4′-diphenyl disulfide, 4,4′-ditolyl disulfide, or 2,2′-benzamido diphenyl disulfide, or a mixture thereof. A more preferred organosulfur component includes 4,4′-ditolyl disulfide. In another embodiment, metal-containing organosulfur components can be used according to the invention. Suitable metal-containing organosulfur components include, but are not limited to, cadmium, copper, lead, and tellurium analogs of diethyldithiocarbamate, diamyldithiocarbamate, and dimethyldithiocarbamate, or mixtures thereof. wherein the negative hardness gradient is from −1 to −5 Shore C, the positive hardness gradient is 25 Shore C to 45 Shore C, and a difference between the inner core surface hardness and the outer core inner surface hardness, Δh, is at least 25 Shore C.
3. The golf ball of claim 1, wherein the difference between the inner core surface hardness and the outer core inner surface hardness, Δh, is 25 Shore C to 45 Shore C.
4. The golf ball of claim 3, wherein the difference between the inner core surface hardness and the outer core inner surface hardness, Δh, is 30 Shore C to 35 Shore C.
5. The golf ball of claim 1, wherein inner core center hardness is about 90 Shore C to about 100 Shore C.
6. The golf ball of claim 1, wherein the inner core surface hardness is about 85 Shore C to about 95 Shore C.
7. The golf ball of claim 1, wherein the hardness of the inner surface of the outer core layer is about 50 Shore C to about 60 Shore C.
8. The golf ball of claim 1, wherein the hardness of the outer surface of the outer core layer is about 82 Shore C to about 92 Shore C.
9. The golf ball of claim 1, wherein the outer core layer comprises diene rubber and a metal salt of a carboxylic acid in an amount of about 25 phr to about 40 phr. 10. The golf ball of claim 1, wherein the outer core layer comprises a gradient-promoting additive. 11. The golf ball of claim 10, wherein the gradient-promoting additive comprises benzoquinones, resorcinols, catechols, quinhydrones, and hydroquinones. 12. The golf ball of claim 1, wherein hardness of the inner surface of the outer core layer and the hardness of the outer surface of the outer core layer are both less than the hardness of the outer surface of the inner core. wherein a difference between the inner core surface hardness and the outer core inner surface hardness, Δh, is 25 Shore C to 45 Shore C.
wherein a difference between the inner core surface hardness and the outer core inner surface hardness, Δh, is 25 Shore C to 40 Shore C.